The Spiny Leaf Stick Insect cleverly blends into its environment, looking just like a dry leaf and will even sway from side to side in order to mimic the breeze. The Green Tree Frog is also known as the Dunny Frog as they like to hang out in the public toilets in Queensland where they’re found. The Murray River Turtle has a clever technique for breathing under water, they can breath through their bottom. You may think it’s unfortunate but the Shingleback lizard appears to have two heads. He uses it as a decoy to confuse other animals. One of Australia’s most iconic animals is the Frilled Neck Lizard, famous for their extremely impressive frills which they use to ward off predators. The Woma Python is found throughout desert habitats of central Australia and they actually feed on other reptiles. 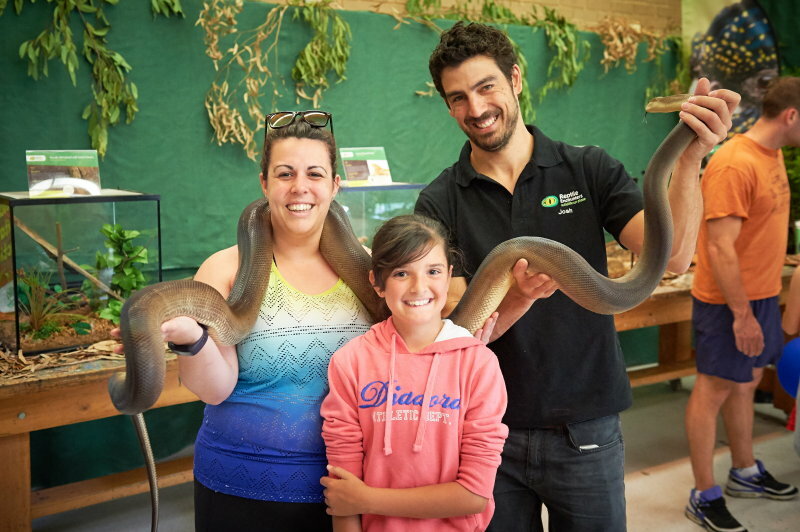 The Olive Python is the largest species of snake in Australia, reaching up to 6 metres in length and weighing up to 70 kilograms. The Saltwater Crocodile is the largest living reptile on the planet, growing up to 7 metres and weighing in at a whopping 1.6 tonnes. Why do different animals have different coverings and external features? Do they live on the ground, in the water or in the trees? Do the animals come out during the day or do they come out at night time? How do they stay safe? For more information on primary school shows and bookings, check out our FAQs here.